The beginning of the year marks an important time for me in terms of seeking God and expecting to hear from Him supernaturally. I blogged about it not too long ago -- I wanted to go through a period of prayer and fasting when we jump-started a new season in our lives. There are many ways people fasted in the Bible. After a lot of prayer, reading and discernment, I felt really moved to fast based on the book of Daniel chapters 1 and 10. During the period of the 21-day Daniel fast, I relied on my Bible, my iPad and the book "The Ultimate Guide to the Daniel Fast" by Kristen Feola. These tools guided me throughout my days of food restriction. 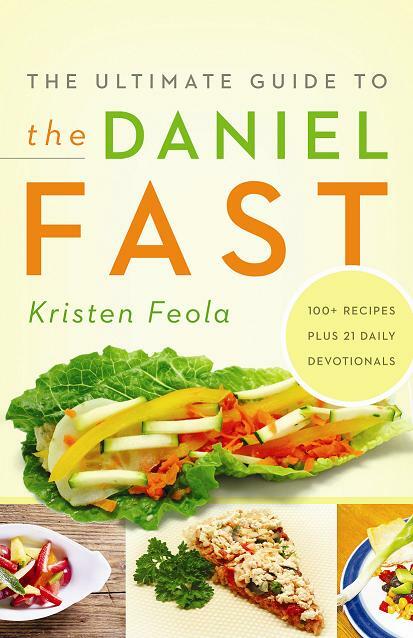 If you plan on seeking God through the Daniel fast, I highly recommend Feola's book. I have several reasons why I strongly feel this makes a great guide. 1) Whether you are a new or a long-time Christian, it is always good to be reminded on what Biblical fasting truly means. The book explains it clearly so that we can always check our hearts on the motivation of our fast. It is not about losing weight (although if you have a food addiction, seeking God through fasting can help you break free from it), earning God's approval or it is not merely the "spiritual" thing to do as a believer. 2) It talks about the basis of this specific fast -- Daniel. In this book you will learn how he was taken to Babylon, refused to participate in the feasts prepared by the king and how his heart was after chasing God instead of indulging in food. I highly recommend that you read it straight from the Bible and seek Feola's book if you need more insight about the story. 3) The book has a daily devotional that really, really helps especially on those days when my flesh and spiritual cravings are at war. I personally did not read all the days (because I found myself taking a long time studying some Scripture that I felt God was telling me to take hard looks on -- my comprehension skills aren't the best sometimes! ), but I can see that it might be helpful to a lot of you who love devotionals. 4) My favorite part of the book is the section on menu planning and recipes. I certainly did not want to spend my fasting days scrambling every day on what to buy, prepare and cook. I wanted it out of the way so that I can focus more on spending time with God. I got a lot of help from the author and it certainly made my life easier! The recipes were fantastic -- all ingredients were familiar and available anywhere. I also had a very happy husband as a result! This book is going to be used over and over again as I intent to set aside a time of prayer and fasting every month. If you would like to have a lifestyle of seeking the Lord this way, I highly recommend grabbing a copy of the book as a reference.